The Knollys Rose Ceremony is held in June each year and is organised by the Company of Watermen and Lightermen of the River Thames. 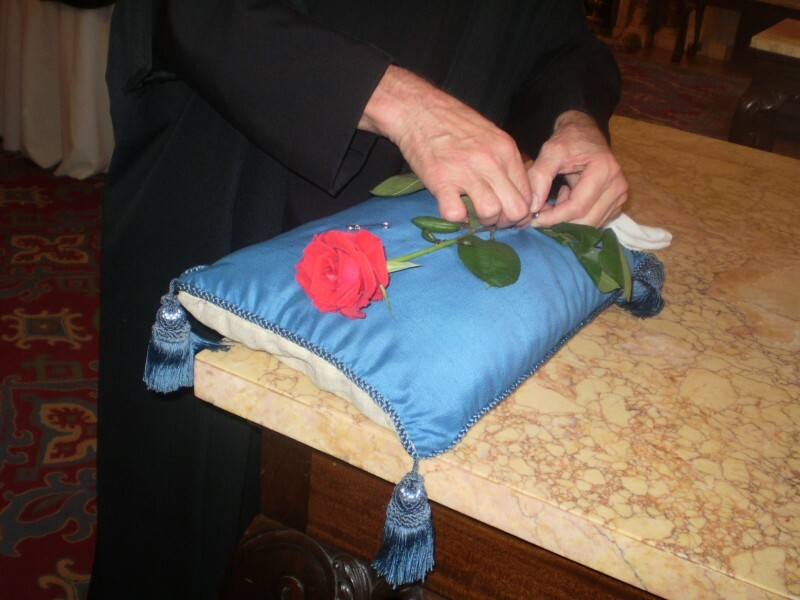 On that day one red rose will be plucked from the garden in Seething Lane and taken to the Mansion House on the altar cushion of All Hallows by the Tower, where it will be presented to the Lord Mayor. The ceremony commemorates an ancient City judgement dating from 1381. Sir Robert Knollys owned a house on Seething Lane. He was sent abroad to fight alongside John of Gaunt. While he was away, his wife is reputed to have become annoyed with the chaff dust blowing from threshing ground opposite their house, so she bought the property and turned it into a rose garden. She also built a footbridge over the lane to avoid the mud, but without the equivalent of planning permission. The penalty was that a red rose 'rent' from the garden had to be paid annually to the Lord Mayor. The rose payment was no more than a peppercorn rent, a symbolic fine upon Sir Robert, a leading citizen and a successful and respected soldier. For this payment permission was given "to make an haut pas of the height of 14 feet" across the lane. The footbridge has long since disappeared, but the legal requirement for the payment of this quit-rent has been established as one of the City's traditions. This year's Ceremony will take place on Monday 17 June, with the cutting of the rose being carried out at 11am in the church garden before being processed through the City. To see pictures of previous events, go to the Knollys Rose Photo Gallery.